Created in 1979, the Windsor Yearbook of Access to Justice was the earliest Canadian journal devoted to the trans-cultural and international study of individuals and groups excluded from the protections of the domestic or international legal orders. The Yearbook is independently refereed, publishes French and English essays and book reviews, is faculty-run and is supported by a distinguished Advisory Board. The Yearbook encourages a wide diversity of essays from a broad range of disciplines, such as anthropology, sociology, philosophy, psychology, history and comparative literature as well as law. We are pleased to announce that the Yearbook is now a fully Open Access journal with all content being free and open to the public. 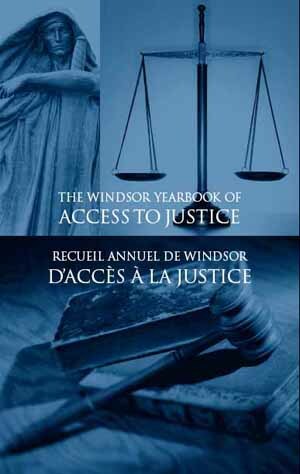 The Faculty of Law at the University of Windsor publishes the Windsor Yearbook of Access to Justice with the assistance of grants from the Ontario Law Foundation and the Social Sciences and Humanities Research Council of Canada. The Yearbook is now available on the Directory of Open Access Journals. In addition, the Yearbook is indexed and abstracted in the following: CSA Sociological Abstracts, Canadian Association of Learned Journals, Current Law Index, Current Law Journal Content, Index to Canadian Legal Literature, Index to Legal Periodicals and Books, IndexMaster, CPI-Q, Hein On-Line, LegalTrac, Lexis-Nexis, Quicklaw, Ulrich's Periodicals Directory, Westlaw & Wilson Web.